So far, I have found or been provided with nine books with references to the 'Volturno'. 2. "Abandon Ship!" A 1974 Hardcover by Hal Butler - ISBN 0-8092-9024-3 - An 11 page chapter on the subject. 3. Great Ship Disasters A 1971 Hardcover by A. A. Hoehling - SBN 402-12053-1 - 2 1/2 pages on the subject. 4. Atlantic Disaster - The Titanic and Other Victims of the North Atlantic A 1986 Hardcover by Richard Garrett - ISBN 0-907675-57-3 - 7 1/2 pages about the tragedy. 5. Fire Down Below: True Stories Of The Most Disastrous Fires Aboard Ship A 1968 Hardcover by Warren Armstrong - ISBN No unknown - 12 pages about the Volturno. 6. They Sailed Into Oblivion A 1959 Hardcover by A. A. Hoehling - ISBN No unknown - 6 1/3 pages about the Volturno. 7. Sea-Toll of Our Time: A chronicle of maritime disaster etc. A 1930 Hardcover by R. L. Hadfield - Published H. F. & G. Witherby - 15 plus pages about the Volturno. times to the present. A 1976 Hardcover by Jay Robert Nash - Published Nelson-Hall Inc. - ISBN 0-88229-140-8 - A giant book of 812 pages - 3 pages about the Volturno. 9. 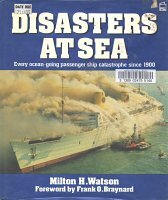 Disasters At Sea A 1987 Hardcover by Milton H. Watson - Published Patrick Stephens Limited - ISBN 0-85059-818-4 - About a page only about the Volturno. In making whatever comments will follow, my intent is not to be critical - of absolutely anybody. I am NOT a researcher & have not had access to any original data in the form of contemporary newspaper articles, descriptive accounts, telegraphic message etc. etc. I simply have attempted to summarise such data as I have been able to locate about the Volturno & provide a distillation of it into a length that a modern reader might wish to read. But, that said, I do try to be accurate in my words, & that gets to be difficult when source data is in conflict. But I do recognise that with the passage of time, facts do not necessarily get clarified. So I will give you what I can, in order to set the disaster in better perspective for interested visitors. My hope is that having read the conflicting words, the visitor might end up with a feel for the true extent of the tragedy. Such at least is my wish. I find it strange, however, that each of the accounts adds some new & often conflicting data. One last comment. I am adding to the 'book list' as I hear of, locate & read that particular book. My comments, as they advance, tend to be what data is 'new' to me & to the site. Which has resulted in the later read volumes getting fewer words of comment. The author, Warren Tute, does provide a bibliography but I cannot tell from that list, or from his Volturno text, the specific sources of his data concerning the Volturno. The Arthur Spurgeon 1913 book entitled "The Burning of the Volturno", is certainly not in the list. But a most interesting read that I did enjoy. I think that even now, 41 years after publication, I cannot transcribe the text legally, though I would like to do so. Tracking down copyright for a book published so long ago is too tough a job for your webmaster to attempt. a) No mention whatsoever is made of the cause of the fire. b) No mention is made of an explosion on board the Volturno that caused the deaths of 80 or 90 persons as other sources state. So did it happen? I cannot answer that. He does describe the launch by the Volturno of six boats, some of which capsized, others were never heard from again & one was smashed by the stern of the Volturno as it rose and fell in the tumultuous seas. 'Six boats had now gone and at least a hundred and twenty lives had been lost'. The total loss of life, per 'Atlantic Conquest', was 132 lives. And at least 120 were lost in those six lifeboats. So was there ever an explosion with 80 or 90 persons killed? I do not 100% know. But I do not think so. So I cut that reference from my words on page 1.
c) The first lifeboat to leave the ship had 22 of the 24 first-class passengers on board. It capsized then righted itself. Three crew members clambered back aboard but the boat was never seen again. And in the total panic, passengers had to be clubbed in order to maintain order & discipline. An article in a Dutch paper on Oct. 12, 1913, available here, listed however 22 names of first-class passengers that were saved. d) In words I found most interesting, it is reported that a German passenger by the name of Trentepol jumped into the ocean, swam two miles to the Carmania in the raging seas & was rescued. Wow! (No such name is in the Ellis Island manifest listing of 463 names (there were about 559 passengers plus or minus aboard) but a person named Trintepohl, a German, was mentioned in contemporary newspaper articles, both items per Jan Daamen's site. Jan provides an English translation from Nieuwe Rotterdamsche Courant, a Dutch newspaper, that said on October 13, 1913 that 'The only drowning person that was picked out of the water by the Carmania is the German Trintepohl, who was rescued because he was spotted with a search light and one sailor ventured out into the sea on a lifeline.') I have not yet spotted a list of names of the Volturno survivors picked up by the Carmania. Trintepohl should be in that list, I presume, in fact he may be the entire list. g) The Captain is described as being 'a magnificent example of courage and tenacity at its very noblest. His eyebrows and most of his hair had been burnt off, his face was seared, his uniform in rags, his shoes all but blistered off his feet and he was nearly continuously blinded by the smoke. Yet he never gave up.' It also says that the Captain ended up blinded for four days. A heroic Captain indeed! h) Some most interesting words also about Second Officer Lloyd, who climbed the shrouds to lash a telegraph aerial directly to the mast when the previous supports had been destroyed by fire. 'On his way down he was overcome by the acrid smoke & dropped twelve feet, landing on his head & shoulders, thus being knocked unconscious'. i) Some of the Polish passengers who survived, taken back to Rotterdam in the Russian ship the Czar, were so harrowed by their experiences that they abandoned the idea of emigrating at all, & returned whence they came from in Poland & Galicia. j) Per 'Atlantic Conquest' there were 657 persons on board & 132 lost. k) Hal Butler's chapter begins & ends with the dream of Christopher J. Pennington, second wireless officer aboard the Volturno. No sources stated but according to Mr. Butler, Christopher Pennington dreamed several weeks before the final voyage that his ship, the Volturno, was on fire in mid-ocean. He dreamed of six rescue ships arriving to take off passengers but that they were unable to do so because of the high seas. He dreamed he was on a lifeboat that was smashed against the hull of the Volturno & he was thrown into the water. He is said to have in writing requested a transfer from the Volturno to any other ship; but that his request was denied because he had given 'insufficient reasons'. 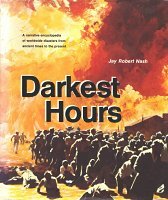 Since the above was written, many years ago now, I now know that Pennington was rescued - but not by Grosser Kurf�rst, rather by the Kroonland. You can see that data on my page 36. And I suspect that the 'dream' was NOT as is described above. But you decide! I have seen so far two articles in the New York Times on the subject, available commencing here on page 9. What is described in 'Abandon Ship' would seem to be essentially just re the first of those articles. And the second article maybe was missed? Until I find more data, & there may be lots more data 'out there', I guess I will accept Pennington's 'rebuttal' words at face value, though the words do sound to me to be a bit contrived. The Marconi company may not have been happy at the publicity! Maybe only Pennington's letter to the Marconi company would resolve the matter! m) No mention whatsoever is made of the cause of the fire or of the explosion that caused (or did it?) the loss of 80 or 90 lives. I conclude that that explosion & loss of life probably did not happen. But who am I to say that? n) Per 'Abandon Ship!' there were 657 persons on board & 136 perished. o) Nine ships came to the rescue of the Volturno & that number became ten, I presume, when the Narragansett later arrived & spread heavy oil to calm the waters. (Confusion on this matter. Jan Daamen & the contemporary reports mention that the Asian from Liverpool was also at the scene, bringing the total number of ships to eleven. But the Asian took no part in the rescue, it would seem.) But see below. The Asian must have done something significant because seven of its crew members were awarded Sea Gallantry Medals re the incident. And now, having read Arthur Spurgeon's book, there may have been a 12th ship, nicknamed the Vulture - hovering in the vicinity, never identified & not ever involved in the rescue. p) The entire journey is described as being an unrelieved hell for the small, overcrowded Volturno & everyone was said to be sick. I had the impression that the ship was carrying only a bit more than half of its usual complement of passengers - capacity about 1,000 & 564 only passengers on that particular trip. So was it indeed overcrowded? I had not read elsewhere that all the passengers were seasick. q) No mention of the cause of the fire but the text states that salt water pumped into the burning hold mixed with items of cargo & caused explosions. Had not read that before. r) The junior wireless operator C. J. Pennington is mentioned. He is said to have jumped overboard to try to reach a rescue boat from the Grosser Kurf�rst but sank deep below the surface & when he bobbed up he was way past the Grosser Kurf�rst boat. But was hauled aboard by the next boat which was from the Kroonland. s) Per 'Great Ship Disasters' there were 657 persons on board & 133 perished. t) The bibliography mentions that the burning was documented in the The New York Times, Literary Digest, Illustrated London News, London Times & many other sources. Specifically mentioned is "S.O.S. to the Rescue" by Karl Baarslag, published in 1935 by Oxford University Press. u) Mr. Garrett (1920 - ) states that the Volturno had originally been built for the Canadian National Railway Company at a cost of ₤80,000. And that 260 of the passengers aboard the ship were travelling to Alberta & Saskatchewan. v) One of the containers of barium oxide was smashed in the violent motion of the ship & that is stated to be the cause of the fire. The male passenger who noticed the fire, raised the alarm & then flung himself overboard in panic. w) Very soon after the fire commenced the number of casualties was already more than sixty. The position of the Volturno was 49�12'N 34�51'W. y) The Carmania landed just one survivor of the Volturno - Walter Trintepohl. The others that the Carmania landed were not from the Volturno but rather were the crew of the Minneapolis's lifeboat. A lifeboat from the Minneapolis, manned by an officer & six crew members, tried without success to effect a rescue & spent five hours in the high seas before being picked up by the Carmania's searchlights. All were rescued. z) 521 were saved out of 657. And therefore 136 were lost. aa) It would seem that Volturno Radio Operator Seddon, heard somebody yell "You can't send us out in these cockleshells, not in a gale like this. We'd be drowned the moment the boats hit water." - before the first Volturno lifeboat was launched, I believe. ab) One of the seamen pulled a gun on Captain Inch. "There'll be no more flamin' discipline in what's left of this ship. We've taken over, see..." But five migrants rushed him & there was a tumble of bodies. Moments later one of the five passengers was seized, lifted shoulder-high by deckhands, pitched over the rail & shot as he surfaced: one of his shocked compatriots seized an axe from the lifeboat, lurched towards the killer, tripped & stumbled against the rail, fell across it & down into the seas. - all as some of the crew were preparing to launch a 4th lifeboat to save themselves, it would appear. ac) Per a passenger aboard the Carmania - "We could see men and women, their clothing on fire, leaping from the ship and swept away by the sea." ad) Captain Barr of the Carmania had six empty lifeboats lowered to drift to the blazing vessel. (I thought they were life rafts). af) Mentions that as the rescue was finally in progress, no less that 35 lifeboats were on the sea at the very same time, each boat doing its part in the rescue effort. ag) Sailors formed human ladders down lines & cargo nets strung over the sides. Older women & babies were passed from hand to hand into the cluster of boats waiting beneath. ai) States that Walter Trentepohl had been carried past the Carmania, in the high seas, ten times before being rescued. Have not read that before. ak) Would seem to indicate that 1st Officer Spangenberg, was in temporary command of the Grosser Kurf�rst at the time & was promoted to Captain only later. al) Refers to the Board of Trade 'Court of Enquiry', presided over by Lord Desart, Wreck Commissioner, which opened in London on Nov. 26, 1913. The author would seem to have had access to the resulting report and uses different spellings for quite a number of the many 'players' involved in the disaster. Captain Inch's name is recorded differently, as an example - as G. D. Inch instead of Francis J. D. Inch. 1st Officer Gardner of Carmania is spelled as Gardener. Typographical errors, perhaps? an) States that 57 of the 657 aboard Volturno were crew members. I think that the crew number was rather higher, such as 93.
ao) There were many rescue vessels, 11 for sure & maybe 12. But certainly not eighteen, as the text states. ap) Advises that the third Volturno lifeboat lowered was swept astern. And 'the churning propellers of the liner sucked the boat under grinding her to pieces. All in the small boat drowned in full view of Inch and the officers...' Capt Inch states that there was, in fact, one survivor. Suderstrohm, the boatswain of that lifeboat, fortunately survived, as you can read on page 9.
ar) The brief text reminded me that the Volturno facilities were mainly for Third Class or steerage passengers. And that it had accommodations for only 24 First Class passengers. It also mentioned that on its final voyage, Volturno carried 22 First Class passengers only. I do not recall reading that number before. as) The volume contains an image of the Volturno afire in the Atlantic with the Grosser Kurf�rst in attendance, the image being attributed to the Richard Morse collection at 'The Mariners Museum'. To the first Thomas Hemy Datapage and painting index page.